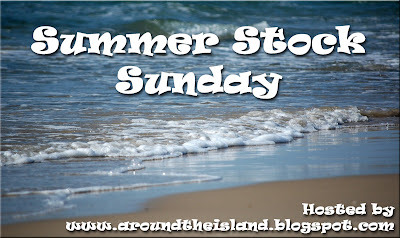 Around The Island: Welcome to Summer Stock Sunday! Summertime here in Israel means blue skies, aqua water, and days spent outside enjoying it all without fear of cold or rain. Imagine my delight yesterday when I found a way to combine all of these for my inaugural Summer Stock Sunday post during our visit to Apollonia, the ruins of a Crusader fort and city on the Mediterranean coast just north of Tel Aviv. Apollonia has been home to 2,500 years of settlement, and was the site of the decisive battle which established 100 years of Crusader rule over the region in 1191. You can read more about its history in the link above. We were walking along the cliffside path to the site when to our surprise we saw a paraglider whoosh by overhead, and then a few seconds later another one. The real surprise though awaited us on the far side of the ruins. I've never seen so many paragliders up at once, it was really a sight to see. The bathers on the beach down below were looking up at them too. This guy flew close enough for me to see him grin as he sailed by. Here he is just a few seconds later. It was amazing how quickly these guys moved through the sky. I really didn't think he'd clear it. I hope you enjoyed this first Summer Stock Sunday peak at a summer day here in Israel. If you did, put up a post of your own and come join in the fun. I can't wait to see what summer looks like to all of you. I am SO excited, I'm first. Looking forward to many wonderful shared photos of everyone's summer! Apollonia looks like a very interesting place to visit - I would probably not get very far, though, for gawping at the paragliders. Such a jolly sight. These are wonderful photos. That's a great looking place to absorb some history and beauty. That water is deliciously blue. The 3rd photo is phenomenal! It tells the whole story! Gorgeous! The last one is really scary, isn't it? I think you are very brave to climb the hill! Great shots! *applause* for the inaugural Summer Stock Sunday! Your photos are phenomenal. And imagine the paragliders showing up just so you could add them to your post! Blue sky! How beutiful. Summer is so humid here - it is hard to see the sky - looks kind of greyish. Thank you for the blue sky! What a beautiful place! I lived in California and spent many days at the beach watching paragliders. Your photos brought back lots of great memories! Phyllis suggested I try to play along with your summer photo meme. Thanks for hosting it! These are really striking! Amazingly sharp for trying to catch a moving target like that. And the colors are to die for. Nice to know that even in the middle of all the upheaval, the place is still beautiful. I caught some similar shots at Atlantic Beach last time I was down there. I should dig around and see if I have any I haven't used yet. Minutes... you were mere minutes from where we used to live. We were straight down Wingate - around the corner from Zion Square! I almost forgot Robin, but I have added two extra pictures, for your new meme. I hope you like my contribution! I tried parasailing once and loved it. This photo sharing is going to be fun! I don't think I've seen such blue skies since visiting Mykanos Island in Greece many and many years ago. Beautiful images! These are such interesting photo's. I can't wait to see all the summer! I'm hoping to get some great idea's for things to do as well as getting to see a lot of summer fun! Apollonia looks like a great place to visit. Great shots of all those gliders. A great series of shots. Thanks for creating this new meme. I thought that Texas skies were blue...now I know what blue looks like! You make that seem as if it's a "typical" day. Wish our days were that typical! I'm excited to see everyone's photos! I love this meme--I'll try to post every week. Lovely Photos, I took part, kept it simple, Thank you for hosting a new photo Meme I found it through Julia @ A Piece of My Mind. happy summer beginnings. Hey, thanks for hosting! I'm linking up at the sweet suggestion of Phyllis (Ima on the Bima). Blue sky days for tiyyulim in Israel? I'd be lying if I said I wasn't jealous. Beautiful. I have to apologize, I gave "Jan" credit in my post for your fab meme. Wow, those are great shots! New Zealand weather is moving into winter....bummer. Great shots and such a rainbow of paragliders....thanks for commenting on my blog. Hello! Visiting from Dianne's blog. Your summertime photos are lovely but also the ones of the Old City and the market are wonderful too! I'll be back again to see and read more. Happy day! Each of your images are wonderful and truly hold the spirit of summer! This is a wonderful idea. When summer arrives I will share with you, for now spring has just begun and today is gorgeous but quite nippy. These are stunning photos! Beautiful! WOW! Breathtaking! The beach/sea, and cliffs are so gorgeous. You really captured the moment in your pictures of the paragliders. Incredible and terrifying. I just joined, will put up mine on Sunday. those glider look like such fun! i would totally try that!